If you're the lazy type who want to take it easy on the bicycle, try out one of the "Den-Do-Assisuto", or the electric assisted bicycles. They're nothinig new or minor, and can been seen in large quantities all around Tokyo and in Japan. You may not notice them at a glance since they're mostly in the same form factor of the mama-chari, or shopping bikes. You can distinguish them by the battery pack they carry between the the seat and the pedal. They first kilometer and a few stop and goes on the bike will give you a strange feeling. To feel an aggresive acceleration that doesn't match up with the power you put on to pedal yourself is something your senses do not expect right away. But soon, the surprise turns in to smiles after a few stop and goes when you quickly become used to it. This assisted acceleration is something one should experience. The electrical assist mechanisms on the latest bikes are smart, and controls the level of assistance by sensing the force you put on to the pedals. If you slam the on the "gas", the assisted acceleration is huge, and the assist is soft if you pedal light. The easiest way to experience the Den-Do Assisuto is to rent one. 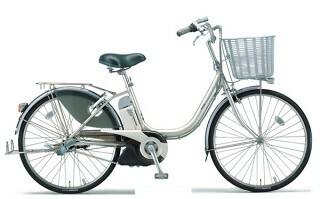 MUJI (Mujirushi Ryohin) at Yurakucho has a rental bike service where you can rent an electric assist bicycle. This page contains a single entry from the blog posted on May 26, 2010 12:20 AM. The previous post in this blog was Staying in a Ryokan. The next post in this blog is Bike Manga.